Every textual part of the project, such as text elements in views, view names, trend names, data-log names, etc. can have its own translation. The following screens show how to prepare translations for every part of your project. Each textual element in view has its own properties. In properties, you can find the default text under the Section “Text” in item “Text”. To provide a Translation for textual elements, fill in the section “Translations” in properties. Each language defined in the project has its own item. Here you can fill translation for every language. 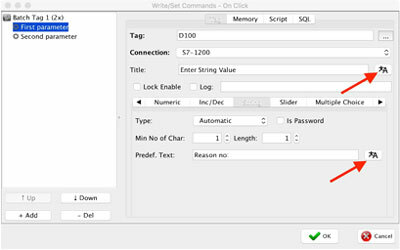 Open Command provides language-specific settings for the option SQL Table. You are able to provide the header column names in the default language as well as in all predefined languages.